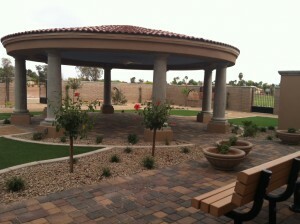 Our Healing Garden is a place of healing in mind, body and spirit. 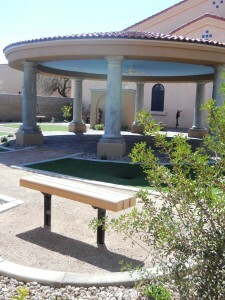 It was designed using the Beatitudes as a tranquil retreat for those facing difficult times, as well as a place of peace in which to honor and remember loved ones we have lost. Columbarium in early Rome meant, simply, a resting place for doves. When Christians, relegated to Rome’s catacombs, began using cliff-side niches to seal away ashes of the faithful who died, the term “columbarium” took on its present meaning: sacred compartments for storage of cremated remains. 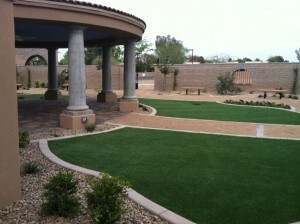 While in modern times the traditional churchyard has virtually disappeared as an actively used place of burial, 1st UMC of Gilbert is able to provide a consecrated, perpetually maintained columbarium for the secure placement of urns containing the cremated remains of both present and former members and their families.Our columbarium begins with a wall that resides at the west end of the Garden of the Beatitudes. The wall contains 80 niches allowing for 2 urns within each niche. 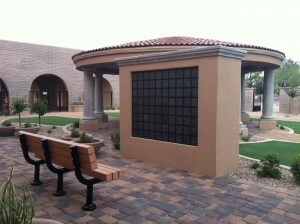 Columbarium niches face the sanctuary creating a more private respectful dwelling place. Urns containing cremains are places within niches and are plated with marble plaques. Funding: With the generous gifts from the C.W. Modene Neely Charitable Foundation and the Kay Collins Bequest fund, this project has been funded at no cost to the congregation. A portion of the monies from the sale of the niches will be placed in an escrow account and used toward the maintenance and upkeep of the garden as well any administrative cost. The administrative costs include the maintaining and accounting of all the records, and the hard costs including the niche, urn and name plate that will be placed on the acquired niche. Blessed are those who hunger and thirst, for righteousness, for they shall be filled.